Have you heard this term before? We are all dealt different cards in life. The cards Jen Turrell was dealt include two beautiful girls on the autism spectrum. Learn about her story and more in this episode! So what thoughts did you have on this one? Please be sure to let me know in the comments below. [00:00:25.9] JH: Welcome, welcome to yet another episode. I am pumped to have you here. It is a new month. It is the month of August and I am just astounded how quickly it has arrived. This month, we’re going to just focus on pure interviews where we’re going to talk about money but of course, in terms of special needs children, divorce, the passing of the spouse and the single woman. Now don’t forget to connect with other likeminded women and our free private Facebook community over at Jenhemphill.com/community. I am so very pleased and so grateful for the caliber of women in there. They are supportive, they are becoming more and more confident in talking about money but also they are becoming more confident with managing their money matters. So for me to sit on the other side and witness that is just very, very rewarding. 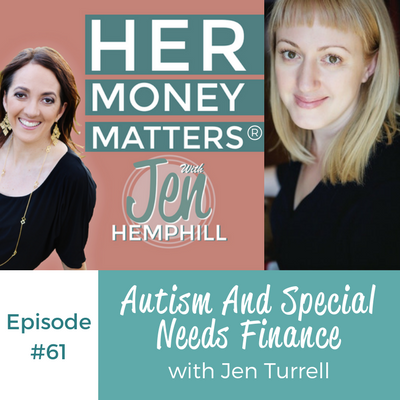 Today, we’re going to talk to a mother of two beautiful girls diagnosed with autism and we’re going to talk about what she calls special needs finance. In today’s episode, we’re going to learn about the letter she wrote her father and why that shaped her views on money for years to come. We’re also going to learn about the one things she wished she knew right away for taking care of her daughters and we’re also going to learn the one thing to be aware off with Medicaid and some things to come with the Program Able, which she is going to explain about. So let me share with you a little bit about Jen Turrell. Jen Turrell is a financial feminist who focuses on helping women working outside of the traditional nine to five to set up systems and work on habits to make their money work for them towards their goals. The corporate structure was not built with women in mind and between glass ceilings, wage gaps and no guaranteed paid maternally, it has never been particularly kind. She sees entrepreneurship as a new women’s movement, one in which we can find new ways to balance breadwinning with care giving and not be punished for things like being incapable of creating a life. So let’s go ahead and meet Jen right now. [00:02:44.0] JH: Welcome Jen Turrell to the Her Money Matters Podcast. I’m so excited to have you here. [00:02:48.9] JT: Thank you Jen. I’m excited to be here too. [00:02:51.1] JH: Well I have to tell you, I definitely reached out to you for a specific purpose because one, well, yes you’re wonderful and you’re big hearted and I love everything that you share on the interwebs but also, you’re experience with just the cards that you’ve dealt with in life so I’m excited to talk about that. But let’s go ahead and get started with just some normal questions. You ready to get started? [00:03:18.9] JH: Perfect, so Jen tell us a little bit about how you grew up around money, your personal money story? [00:03:26.8] JT: Well my childhood involved a number of divorces and remarriages of my parents. So to be honest, while I wasn’t fully aware of the financial situations and ramifications of all of that, I was aware of tension and stress around it all. So I feel like my early experience of money was kind of uncomfortable to be honest. My parents were divorced when I was three and then both of my parents remarried and there was some subsequent divorces. So there was step families and half siblings at different times and I’ve never shared this story before but one story that I think illustrates how awkward it was for me as a kid and how sometimes manipulative adults can be with kids is I remember a time when my mother’s second husband, who was my stepfather at the time, talked to me about the fact that my father wasn’t paying child support, which obviously I knew nothing about. I didn’t know the settlement that my parents had or what it involved. But he explained to me how he paid child support for his kids because he loved them and that my father wasn’t paying child support and he was basically telling me that my father didn’t love me because he didn’t pay child support and he suggested that I write my father a letter asking him to pay child support and I did. I was probably seven at the time, and I’m not even sure what my father thought of it. I think he thought that it wasn’t really any of my business at that age because they did have a settlement that they worked out. It was an amicable divorce and everything but now as an adult looking at that, the idea of asking a seven year old to write my spouse’s ex-spouse to ask them to put money into our household, that was sort of the awkward situations that happened in my childhood that made me feel very confused and very uncomfortable with money. So I feel like growing up, my impulse was to distance myself from it and not really want to be concerned about it and in college, I was really influenced about the Riot Girl Movement and the punk movement. I was in a bunch of bands and starting there, we always DIY’d everything, we hand screened our t-shirts, we pressed our own records, we sold them as cheaply as we possibly could. The goal was always to get things to people at the lowest possible price. The thought was always being fair to other people. So I feel like the influence that my childhood had on me made me a chronic under charger and it really wasn’t until I had my own kids that I started seeing money more as a tool and something that could be powerful and something that I really needed to figure out more about for my own kids. What was I teaching my daughters? What are they learning from me? And also because my kids do have special needs, they’re going to need a lot more care for a lot longer in life than most kids do. My end of life planning doesn’t stop at the end of my life. It stops at the end of my daughter’s life now. So that really moved the goal post for me and made me look at money very, very differently than I did early in life. [00:06:41.0] JH: Right, well thank you for sharing that. So you had the experience that you have with your step dad and that made it awkward with money and then once you had children, that’s when your views, your outlooks on money changed. [00:07:04.1] JT: Yeah, it really did because before that I think I always thought of it as something that caused problems especially in relationships in families. I saw it as not the goals, the goal is not to make money. Success did not mean money necessarily. I had a lot of very personal ethical views about money that weren’t very positive for accumulating money and making well. So I feel like I spent at least half of my life that way. It wasn’t until I was a young adult, well not a young adult, I waited quite a while to have children. I didn’t have my daughter until I was 31. So yeah, it took me a long time to really realize that yes, I do want security for my family, I do want safety, I do want to provide for my kids in the best way possible and I don’t want them to undersell themselves. I don’t want them to disempower themselves by thinking that money is anything other than a tool, that it’s something negative, you know? [00:08:01.5] JH: Right and I like that, that you say that money is a tool and it’s a tool to get you to what you need. I love that. Now tell us a little bit more and this is why I’m excited to talk to you because personal finance is just so personal. Yes, there’s so much advice out there but they don’t know your particular situation, the cards that you’ve been dealt. So you are raising two beautiful daughters that have special need. So how do you prepare financially? You also mentioned it’s about how long they live in thinking in terms of that and preparing financially. So tell us how you prepare financially? [00:08:43.2] JT: Okay. Well my oldest daughter was diagnosed in 2010, which was before Obama Care went into effect and back then, insurance companies could still have autism exclusions and our insurance company had an autism exclusion in place, which is not something that you look for when you buy insurance. I didn’t have kids when we got that insurance, so it completely blindsided me and caught me off guard. I was so confused by how you could just exclude a condition that it was like next to bariatric surgery and things like that. I was like, “Okay, I understand excluding some things that maybe are elective but how could you just say nothing related to autism is involved. [00:09:29.1] JH: Yeah, that’s not elective. Because we did wanted to have the gold standard AVA therapy, the things that were proven to have the best results but all of that was really expensive especially living in rural Arizona. We had to travel to Phoenix, we went to specialists, we sometimes flew specialist to us in some cases. At that time, we were living out in our ranch which was an hour outside of Flagstaff, Arizona. We eventually moved in once we realized both kids were going to need a lot of therapy ongoing and school services and everything. But that was another expense as well, buying a house in town and moving into town. So it’s hard to prepare for something like a special needs diagnosis for your child ahead of time because no one really expects it but to better shape your finances are into start with, the easier it is and especially nowadays with Obama Care making it illegal for insurance companies to exclude pre-existing conditions and things like autism, you can get more of it covered. Depending on what state you live in, there are a lot of state services and school services for it as well. So one of the things that we learned was to really explore all the options and make the most of all these different services and again because we live somewhere that doesn’t have an autism center, if you live in a major metropolitan area, there are probably autism centers where you can go and get all the services you need. We didn’t have that here so we have to piece it all together and find different ways to pay for it. So we use, here in Arizona there’s the Department of Developmental Disabilities, which is through the Department of Economic Security and we get some funding through certain kind of services through that and then through the school, we get funding for other services too and we created a wraparound program where the kids get services both in home and in the community and in school that are all coordinated and that took a lot of time and set up and a lot of expense back when we first did it. [00:11:53.2] JT: And part of the reason I ended up co-writing a book with our board certified behavior analyst was because it was so hard for us to do it and then a lot of other families asked how we did it and once we found the different funding sources, I was able to tell them more how to do it but at first, we were out of pocket for a lot of expenses. We’ve really spent a lot of money on our kid’s services and I wanted to help other families not spend as much especially families who didn’t have resources to draw on and assets to sell and a family to help like we did. So that’s what that book was. Of course now that Obama Care has come through, it’s a little outdated because you can get a lot more done through insurance than we could back when we started. But overall, I think that these days, a lot of us need to at least consider the fact that we may become caregivers at some way in some point of our lives. I know with my kids being young and my parents aging right now, a lot of my friends are in a similar situation even if they don’t have special needs kids. They may have school age kids and parents are in their 70’s or 80’s who may start needing more help. So I think the more families can look at their overall plan and talk to their parents and sometimes things can happen like your spouse can have an accident. There’s so many ways in life that we can end up being a caregiver that it’s worth thinking about like what would we do. [00:13:20.9] JH: Right that is a good conversation to have because you’re right, life can change in a matter of seconds. It’s just the realities not talking negatively, it’s just life. So that is a great thing that you brought up. Is just having that conversation just in case. [00:13:41.1] JT: And talking to your parents about their wishes and what they want and what their financial reality is right now. Like when would they need help, will they need help, what kind of help do they want? Do they want to stay in their own home? Do they want to move in? There are a lot of things to discuss. [00:13:59.1] JH: Absolutely, I agree and I know you mentioned that because of the changes and Obama Care and what it covers and whatnot, what would you say are no kidding go-to resources that someone with a child with autism should tap into? [00:14:19.3] JT: Well, there are some national ones. There’s the Autism Society of America is a great one to find out about services. Also Autism Speaks has a lot of things. They’re a bit more focused on young kids and early intervention more than teens, adults, young adults. So those are a couple of good places but for actually getting services, it’s really within your state. So if you are concerned about your child’s development, usually the first place to go is to your paediatrician. Your paediatrician can then refer to the specialist in the state to get the assessments done that needs to be done. There’s usually some kind of early intervention program in every state so you can get referred to the specialist who do the assessments there and then that puts you on track to get into the system for the state Medicaid funded resources. Here in Arizona, what was it called? It’s been a few years now. My kids are six and almost nine now. So early on, it wasn’t a head start but it was something similar to that. I’m trying to think of what the early intervention program was called, but within the paediatrician’s offices, there are cards there too like, “Are you concerned about your child’s development? Call or talk,” to their website that you can look at so within any state, I think you could search for that state and early intervention and find out what is available. I know here in Arizona, we’ve been able to quite a bit of respite services as well as habilitation and actual therapy. So I thought that was the norm and talking to people in other states, I realized it’s not always as focused on respite. Here in Arizona, they really make a point of trying to keep people in the home, people with special needs in the home and in the community based services rather than going into residential services so because of that, they give a lot of respite for caregivers, which is really nice. But a lot of states do do it to some extent. It’s just here, we get a little bit more. Going through your state’s website, you can look up disability services with your state’s name and you should be able to find things there. That’s probably the quickest way to find out what services are available. But again, talking to a paediatrician or a doctor about getting referrals, that’s really how you get into the system. [00:16:35.2] JH: Perfect and what would you say is one thing that you wished you knew right away? Because I know you’ve mentioned flying the doctors in for services, having to travel because of the location you were at, you actually moved to a different location to be closer to those services, there’s definitely a lot of money and expenses going that you had to pay. So what would you say is one thing that you wished you’d knew right away? And plus, you’ve helped people as well. People have come to you to for you to help them figure these things out. [00:17:10.7] JT: Yeah. There are a lot of things I wish I knew earlier. One of them is with my oldest daughter, we didn’t recognized what was going on for quite a while. It was our first child, we were living in a very secluded rural area, we really didn’t have any other kids her age around to compare to. So I definitely wished that we’d known to get help sooner because with regressive autism, she ended regressing a significant amount. We lost almost all verbal language in the course of trying to figure out what was going on with her and I was pregnant with our second child at the time. So definitely I wish I had known how to get help earlier. With my younger daughter because we have gone through this with my older daughter first, the second we started seeing signs of regressive autism, we put her straight into therapy and she’s been an amazing success story for early intervention. She’s doing fantastic, she’s academically advanced, her verbal communication is advanced for her age as well. She still struggles with certain things, I’m not going to say she’s cured by any means but I can really see that getting a kid in at 16 months old, which is when we started her therapy versus three years old when we started our oldest daughter’s therapy makes a big difference. But of course, the kids are very different too. Tulula has other medical issues. She has a white blood cell disorder, she had migraine, she is tube fed, she’s had a lot of medical procedures that her little sister hasn’t so all of that affects it. So on the medical side, I wish we’d just known who to go to earlier to get her started faster. On the financial side, we were in such reactive mode. It felt like we just had to throw everything we possibly could at her early intervention as quickly as possible. At that point, when we first started and we were spending the most money, which was very early on, we really weren’t thinking long term. I think our hope was, you read these stories of kids who get into early intervention and have the kind of results that my youngest has had where they are going to eventually be independent in school and hopefully be independent in life and work and have all the possibilities that everybody else has. I kind of didn’t want to contemplate not having the best possible results with my oldest and while she’s done really well and she has come a long way, she will probably need significant care for the rest of her life. So now looking at the way we’ve spent, the money that we spent on her therapy and everything, we’ve really had to refigure our long term goals. Like I said before, it’s changed our retirement goals, our retirement account goals are much larger to last a much longer time now. I mean I’m not going to say any of money that we put into it early on was misspent because we didn’t know what else to do at the time but I do think parents need to think about the long term even when they get started with early intervention because on the one hand, you want to get them the best possible care that you can and use the most effective therapies. When it’s not easily available, you can spend a lot of money doing that, which we did. So now, I wish we might have tempered that a little bit to put more towards the future, that’s probably what I wish I’d known. [00:20:30.6] JH: Gotcha. No, that’s great thinking and great advice right there. Would that be your best advice? So if a parent came to you and just finding out let’s say some news and they are emotionally, it takes an emotional toll, I can imagine and then financially figuring out how much money all of this is going to cost. What is the best advice you can give to that parent? [00:21:00.3] JT: Well I would say make sure you make full use of all resources possible that are available to you through the state and through insurance and all of that first and yeah, really try to be tempered and measured with the personal expenses because they may go on for a very long time. I would also want to make sure they understand the Medicaid cap as well, the asset cap for their child, which is something I didn’t learn about right away. We did eventually made a special needs trust for each of our kids. Are you aware of the Medicaid cap and why special needs trusts are so important? [00:21:38.1] JH: I am not. [00:21:40.2] JT: Okay, so this is something I have a real personal problem with. For Medicaid benefits, there’s a $2,000 asset cap. I was talking to Danetha Doe on her show about this and she said, “Oh okay so $2,000 a month,” and I said, “No, not $2,000 a month. $2,000.” And she was, “Oh, so $2,000 a year?” And I said, “No, $2,000.” You have to be incredibly asset poor to take full advantage of the Medicaid benefits and as you have more assets and make money, you can lose your benefits quickly and significantly. Thank goodness, President Obama in 2014 signed the ABLE Act, which is “Achieve a Better Life Experience”, that’s what it is, ABLE. Because the issue was if you have a child without special needs and you want to start saving for their college, you can use the 529 plan, right? But if you have a child who isn’t going to be able to go to college but has these special needs who really needs a lot of savings to go towards their future life, there was no way to do it without endangering the Medicaid benefits and with any kind of tax advantage. So what the ABLE Act is, is basically trying to establish a similar system to 529 plans for people with special needs. [00:23:03.8] JT: And it has a $100,000 cap for that. So before that was signed, there really was no way for your child to have assets that wouldn’t endanger some of their Medicaid benefits, which for my daughter, she’s tube fed, she has a number of procedures, her medical expenses were we to lose those benefits would be very, very heavy for us to bear as a family. Because she has frequent procedures and I love the Medicaid system when she did get into the Medicaid roles and we stopped getting all the bills from the hospitals for all of her procedures and test and stuff, it was amazing. If she needed something and it was referred by a doctor, it happened and we didn’t even get a bill. Whereas before that, all of the testing of the stuff and every time she went to the hospital, I could get four bills for a single procedure. The anesthesiologist, the surgeon, the hospital room, the recovery room would have a different bill and it was really confusing especially because all of that would be turned into your insurance. They would send you the original bill and say, “We put this through your insurance for your convenience.” So I’d wait to hear from the insurance how much was covered. There was a point where some things were sent to collections just because I thought I was waiting for insurance to get back to us and I’d gotten so many bills for the same procedure. It wasn’t that I wasn’t willing to pay, it was just that I got confused because we had so many things. So yeah, it’s difficult and once we got into Medicaid it was so simple and I was like, “I love Medicaid. I love it.” When she needs something it happens and I don’t get any bill. [00:24:39.0] JH: Right, so basically Medicaid does have that $2,000 cap but with ABLE, it’s $100,000 cap that they can have an assets? [00:24:51.9] JT: Yes. So you have to set up the account and right now here in Arizona, it hasn’t happened yet. The bill got signed, they’re working on it, they aren’t available yet in a lot of states but they are working towards it. So prior to that because that didn’t happen until 2014, we set up special needs trusts because what happens if everyone else in our family were to predecease her? She would be the recipient of all of our worldly goods. So we have to set up a trust to intercept all of the assets so it wouldn’t go to her and she would lose her Medicaid eligibilities because it’s possible throughout her life. [00:25:25.3] JH: There’s so much to think about, oh my gosh, so many details. Wow. [00:25:29.6] JT: Yeah, so that’s a safety precaution and I think families, even if they do do an ABLE account still should do a special needs trust because if something catastrophic were to happen and all other members of the family passed away, that your house would disqualify your child for Medicaid eligibility and things like that and there are a few ways around it but it’s a good thing to have to set up a special needs trust. [00:25:56.9] JH: Well this is good stuff Jen. I’m glad that you are mentioning all of that because this it’s definitely going to make a difference to someone. So let’s talk about some fun stuff. We’ve covered some serious stuff, so let’s talk about what has been the best money you’ve spent? [00:26:15.4] JT: Probably the early intervention program really. [00:26:18.0] JH: Okay, I had a feeling it would go back to that because I know how much love you have for your daughters and tell me your favorite way of paying. Are you more of a cash, check or credit or even debit? [00:26:31.1] JT: I am not a cash person mainly because I’m not fantastic in keeping track of cash. Prior to all of these tracking apps and things like that, I was not that fantastic at it. I’m a naturally disorganized person so the best way for me to do it is something that gets tracked automatically as I use it. So I do use, we have a great Chase Sapphire travel rewards card that I run most things through. My husband’s British so we do use the points to go visit his family in England. [00:26:31.1] JT: I use Mint.com to give me my overview of all of our stuff. We have a few businesses between our ranch and our record label and then my online business helping women with money. So we do separate accounting for those but I put everything into Mint so I can get the overview on my phone. I can see what transactions have come in and gone out. So I really like electronic tracking. I do very little with cash. [00:27:27.4] JH: Make sense and give us a little quick rundown on a monthly basis how, because I know you’re a systems type person just like me so tell me a little bit about how you managed those personal finances just amongst living life, what kind of system do you have in place? [00:27:45.8] JT: Okay, so my systems are based on two things. One is Ramit Sethi’s I Will Teach You to be Rich book where he talks about automating your regular bills as well as negotiating and then I took Amanda Steinberg’s Money Clarity course where she had you actually make a separate bill pay account. So I have a separate bill pay account where I automate as many payments as possible and I also did Ramit’s batching and scheduling things. So that you batch your bills together twice a month and I like that because having a separate account, my husband and I each have our own spend accounts, our own personal cash accounts and money goes into those from our salaries and it goes out of those into the bill pay account. The bills all get paid out in the bill pay account and what’s left in our spend accounts is what we have to spend for the month. So that’s really all that we manage is what’s in our spend account and it never endangers any bills. Mortgage or anything like that, those are already paid out of the bill pay account. [00:29:05.1] JH: This is going to save me so much time. [00:29:08.6] JT: This is going to be so much easier. Yeah and stress and also just putting everything. This is going to be so much easier and stress and also just putting everything on auto pay even credit cards and everything, I get the notification, “Your auto pay is going to happen in three days.” I can check to make sure there is plenty of money especially with having special needs finance stuff going on. There’s some months where we have much higher expenses than other months. So having those couple of days to check to decide, do I want to set it to pay in full? That happens sometimes when I’ve not been able to pay in full so I have to adjust it but that gives me the time to adjust it and make any changes that I need. So for the most part, I try not to carry credit card debt. There had been times in my life where I have. [00:29:48.5] JH: I hear you. Well that’s great and I love the separate bill paying account. We do the same thing and I even go further in just we just separate, depending on our groceries and we have a separate account for that. That way it helps with the communication, for me communicating with my husband, “Hey, this is what we have for our groceries,” and it’s just one debit. We use it as a credit but one credit card that we use for that account and the bill paying is just for that. The money gets deposited in and everything gets paid out of that so it works beautifully and I know you mentioned you love apps, so what is your favorite money related app that you like to use? [00:30:33.3] JT: Right now, it’s actually one that you told me about which is Ready for Zero. I love Ready for Zero. [00:30:39.2] JH: Awesome, I’m so glad that you like that, love it. It’s a great app, I talk about it and I also share Powerpay.org just because it allows me to teach how to put your debt in there whereas Ready for Zero since it connects, since you have to connect to different accounts, I had a hard time since we don’t have any current debt, I can’t get in there to show. [00:31:05.8] JT: Oh wow, congratulations. See I put on mortgage and I have one car payment left that I haven’t paid off because it’s 0.9% so I leave that in there and yeah, I just put everything. So it does look like I have, because our mortgage is in there that is a relatively big amount but it’s also so cool just to see that daily interest and then to look at as I change the amount that I am willing to pay and I was actually pulling it up on my phone but I forgot I put it in airplane mode so it wouldn’t ping while we were talking. I have to look at it after this but yeah, I think it’s such a neat way to graphically see what’s going on with your debt. So I’ve been recommending it to lots of people. I have a module within my membership group that’s on how to work with your debt and I was like, “Actually if you use this, it’s much simpler than the spreadsheet that I was doing because you’re looking at it. I really like the avalanche method where you pay off the one with the highest interest first because that is what brings down that daily interest amount. And looking at that, one of the things that I love most about the daily interest amount is David Bach’s Latte Factor, how he wants you to give up your lattes and I dunno? I do feel like having some nice little pleasures in life on a regular basis go a long way to keep you happy whereas looking at if you have $12 a day in interest and you can pay that off, instead of giving up your latte, give up the interest on your debt by paying the debt off faster. Then that will fund your retirement account or whatever it is that you want to put that towards. Of course, that’s easier said than done. It does take time to get there, but it still is exciting when I saw that daily interest. I haven’t seen that anywhere else. [00:32:47.1] JH: No, it’s good — I mean I love that you can just play around with the “what ifs”, right? And that’s what I really like because that’s what motivates people. It’s like, “well what if?” we were talking about lattes and what if I minimize it to one cup of coffee a week or whatever and this is how much money extra I’ll have, how will this impact? And that’s, I see a lot in my clients get excited when we just play around with the numbers just with what if scenarios and then work backwards from there so awesome. How about your favorite money guru celebrity? [00:33:24.3] JT: I have to go with Amanda Steinberg. I love her. [00:33:29.2] JH: She’s awesome, from Daily Worth. [00:33:30.8] JT: Yeah from Daily Worth. One of the things I love is she’s been so inspirational to me because she isn’t a CPA or a CFP. She was the CEO of her technology company first and realized that the struggle that she was having with money applied to a lot of people and wanted to share and to be honest if I hadn’t encountered her, I don’t know that I ever would have thought of going into finance in any way and my journey was very confused to it. It starting out with helping other autism moms get services for their kids, I was an autism mom mentor. But with so many of the moms, just looking at their finances was really difficult for them and trying to figure out what they needed to pull together for needs based funding for things. I ended up doing a lot of financial counselling and I really don’t have much training in this. I’ve been an entrepreneur since I got out of college. Most women and especially I work with a lot of entrepreneurs, there’s a point where you do need to get an accountant and you need to make sure that you are doing all of your taxes right for your county and your state and everything like that. So I would never say that anything I can help someone with replaces a professional because it doesn’t at all. But I feel like there’s so many people who have resistance and barriers to getting to the point where they feel ready to go to a professional and I think people like you and me can help with that. [00:35:18.8] JH: Absolutely and that’s why I’m doing this podcast so that way, it’s an easier conversation where it’s not of just about number crunching and “hey, you need to go save” or “hey, you need to get out of debt”, which all that stuff is important but it’s about also the quality of life. Personal finance is just beyond the saving, beyond the retirement, beyond the debt. It’s about people like you that are dealing with different situations, personal situations and how to manage the money and how to, in life in general, and how to do all of that together and that’s different. So different for every person which is why I definitely wanted to have you on here to speak to other families that are in your situation. So this has been great. [00:36:07.5] JT: I think one last thing that I wanted to add in there is that I think particularly for women, there are a lot of emotional issues attached to our money. Like that story that I was telling you with my ex-stepfather kind of manipulating me to approach my dad for money, yeah I thought of that the other day and was like, “Wow, I think that had a big effect on me.” I think it really affected what I thought about money for a long time and it made me feel guilty and icky and weird. I hadn’t thought of that story in many, many years but it came up and I think a lot of us have stuff like that and then with my kids, realizing that what money means now for me is security for my kids and services for my daughter into the future and being able to find more options for her and I do want her to continue her education after high school. That’s one issue that a lot of special needs kids that they can’t go to traditional colleges if their needs and their academic level doesn’t get up to that point, there are other things that can be done. But it’s up to the parents to find and fund those things and figure it out and figure out job skills and what’s going to happen next and I want my daughter to have as many options as possible. I wanted her to have a really rich and fulfilling life at whatever level she’s able to participate with other people. I want it to be a really good experience for her. So seeing money as that instead of something that’s divisive and difficult in families that’s a change. It’s just the way I feel about it and the way I look at it but it’s really changed with how I dealt with money. [00:37:43.5] JH: Absolutely and I completely agree. This has been such a fabulous conversation Jen and as you know, this podcast is all about making money simple and taking control of it so how would you finish this sentence: Her Money Matters because ____. [00:37:59.0] JT: Because money is power. In our world, its power and its value, it’s how we put value into things so women not taking control of that is disempowering yourselves. [00:38:13.9] JH: I love that answer. Well thanks again Jen for being on the show with me today. [00:38:19.8] JT: Thank you Jen. [00:38:23.0] JH: So that was the fabulous Jen Turrell. I hope that you enjoyed hearing from her as much as I enjoyed chatting with her. I definitely learned a lot from her and definitely had some take aways that one of them which I want to share with you but before I do, like usual I want to do a quick shout out, quick recognition from someone in our community and this week, I wanted to recognize Shannon and even though there is multiple Shannon’s in the group, she’ll know who she is after I mention what I’m going to mention. So she’s a member of our free Her Money Matters community and she’s been super active and engaged and very transparent of her personal financial situation and being transparent of the personal financial situation, I’m sure it was tough but freeing at the same time and Shannon I can already tell your determination and that you are taking action from the books you’ve read in the past. From Dave Ramsey, from both Dave’s as you’ve mentioned, and Dave Bach to what you’re doing now. So keep it up Shannon and by the way, thank you for binge listening to this podcast. So let’s get into today’s take away from the chat with Jen Turrell. For me, of course the bigger take aways are all about special needs finance but I wanted to share another take away as well as the more personal one is about her personal money story and notice that she didn’t realize until recently that that memory may have had an impact on how she’s been perceiving money. But take it a step further and reflect as to has that affected you, do you think there’s some things today of how you treat and manage money that go back to that memory? Maybe there aren’t but take a moment to reflect. So I challenge you to do that and if you do do that and are in the Facebook group, let me know that you did that. I love to hear from you. So that is a wrap and don’t forget to join us for the fun because it continues over on the Facebook group and the free community at Jenhemphill.com/community. Next week on the podcast we will be having an interesting conversation on divorce and what impact it had on our guest becoming fully in charge of her finances. So don’t miss episode 62 next week. And I want to thank Jen Turrell for joining us, for sharing all her knowledge, all her tidbits, her money story. Be sure to check out the show notes on where to find Jen and more at Jenhemphill.com/61. So thanks again for joining me and we’ll talk again next Thursday.